It’s an interesting fact of television’s place among the ever-growing number of screens in our daily life that—even with the transition from analog broadcast to digital distribution, from serial formats to multiple-season story arcs—there has never ceased to be an entity that is culturally identifiable as “television.” We don't even have to touch a television set in order to “watch TV,” a practice that now encompasses a multiplicity of devices, receptive postures, temporalities, and spaces. 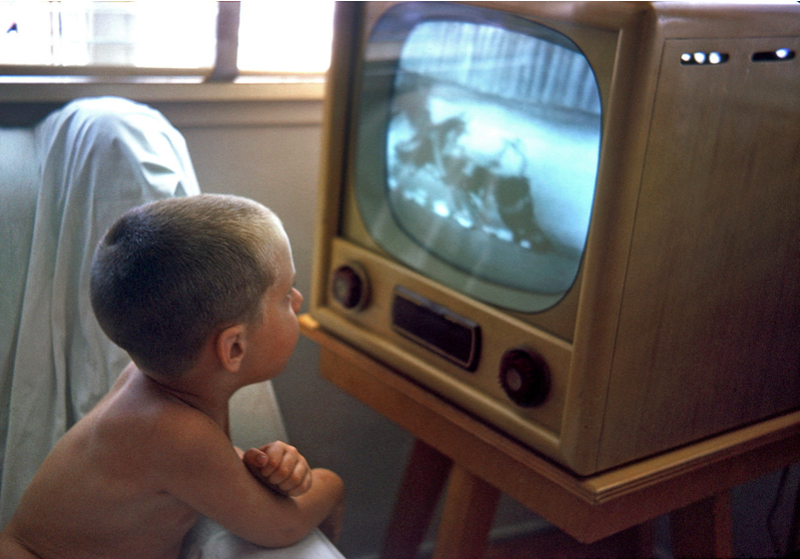 To watch television, elegantly captured by the German verb fernsehen (literally “see far”), a verb for which there is no English counterpart, is today a cultural technique unmoored from the specificity of any one tool, experience, or aesthetic form. What I would like to suggest briefly here is that, now that the medium of television has become virtualized and distributed among many different devices and systems, specific narrative formats allow television to hold together as an identifiable cultural form. In the shift from analog broadcast to digital distribution, from sets to apps, the rhetoric of “content” plays an important role in maintaining the identity of “television after TV,” to invoke the title of Jan Olsson and Lynn Spiegel's edited collection on the topic. And that means that more than ever before, theories of television must take narrative into account when asking questions of medium specificity. Assessing these changes is difficult partly because the question of television's identity has been an unsettled one from the start. Settling on a critical framework for television remains one of the most famously slippery endeavors in media studies. Ever since the debate between Marshall McLuhan and Raymond Williams on the politics of televisual aesthetics, there has been a great divide in how the topic is approached. For McLuhan, the significance of television had to do not with its broadcast content but with the nature of its sensory effects: “the instant flow of TV imagery tends to immobilize the motor muscles of the eyes, creating sleepiness and also impeding the eye movements necessary for reading print, where the young are concerned.” For Williams, McLuhan's intensive focus on media aesthetics blinded him to the politics of broadcast content. In this way, “All media operations are in effect desocialized; they are simply physical events in an abstracted sensorium, and are distinguishable only by their variable sense-ratios.” Williams argued that the scholar must remain attentive the politics of content. For the television industry, the problem can be encapsulated in a slippage within the word “network.” While broadcast was based on a hierarchical model of distribution—from a certain corporate network's tower directly to the individual sets of a receiving or subscribing audience—digital content delivery networks not only redirect users to innumerable replica servers, but in some versions of multicast distribution, those users' computers act as proxy servers themselves. Viewers become distributors, points of origin within the network, and the hierarchical structure of broadcast distribution is itself distributed. In 2008, for instance, NBC/Universal experimented with a managed peer-to-peer model of distribution that was in essence a modified version of the very BitTorrent protocols the company hoped to combat. Second, within this ubiquitous network of content delivery, television must now be differentiated through a set of viewing practices and aesthetic criteria aligned more fully with the narrative specificity of individual formats. Increasingly, individual TV series extracted out of the broadcast flow receive more emphasis as the constitutive element of television, as opposed to the “liveness” of the broadcast in earlier models. You may be more willing to say that you're “watching TV” if you have the Hulu app open on your phone than you would if you're watching a video on YouTube. If televisual content was before considered to be little more than a smorgasbord of preexisting social forms delivered in order to serve the expansion of national broadcast networks, how then might we define content today when it alone seems to bear the burden of differentiating televisuality in the context of digital networks? “Content” used to evoke something like raw story material or fabula, that heterogeneous abstraction that only becomes visible against the presence of its individual manifestations in narrative form, plot, or syuzhet. Extracting “content” from “form” allowed one to place the circulation of culture in a conceptual freeze-frame at the very moment in which a story, a proverb, or a human life “assumes transmissible form.” For Walter Benjamin, to talk of a story was merely to ground the presence of “that slow piling up, one on top of the other, of thin, transparent layers which constitutes the most appropriate image of the way in which the perfect narrative is revealed through the layers of various retellings.” Because content provided “no explanations” and was “utterly dry,” it remained the imaginary kernel that offered itself up out of individual form to be inexhaustibly crafted and transmitted anew. It is now almost impossible to hear these echoes in the word “content.” Instead, we speak of “content owners,” “content vendors,” and the “content industry.” Under the slogan “content is king,” content has become a vital utility delivered to every home as if through a series of tubes. Content gains currency in a network environment where information begins to proliferate in an uncontrollable way. The importance of evoking the “content” of networks has nothing to do with the creation, circulation, and modification of narratives. Rather, the investment in the term lies in the control it enables over a certain structure of transmission, reception, and use. The question is then, what has narrative form become under the regime of “content”? For Benjamin, abstract, “utterly dry” content required time to locate and explain, and in this very repetition, content was rendered no longer content but form. Content “explained” nothing for the individual narrative, but remained the condition of its transmissibility. For content owners, on the other hand, “content” serves as an absolute boundary that is able to determine the conditions for the transmission of a proprietary material. What once named an abstract point of origin for the diffuse circulation of culture can now be localized in a single, homogenized unit. Today, as television transitions from a hierarchical broadcast model to one of digital distribution, content stands at the center of a much wider power struggle between two diametrically opposed network discourses on the information economy: the centralized model of media conglomerates and the decentralized, distributed networks of peer-to-peer protocols and pirate communities. The transition of television into a digital environment provides a litmus test for the ability of a medium to resist disintegration under a discursive set of material conditions. And in this distribution of distributive modes, we can see the rhetoric of content flare up as both the lifeblood of an industry attempting to reinvent itself and the sign under which a whole new series of narrative forms are organized and experienced. As Michael John Starks shows, new legal frameworks for televisual content are now even serving as a regulatory model for other industries like web journalism. Going forward, if we are to update the notion of television as “a certain kind of vision,” I think that we should take very seriously the contemporary discourse on content as a new paradigm, and not just dismiss it as an oxymoronic misuse of narratological terms. Now that “content” contains within itself connotations of television's narrative forms as well as an attention to the mercurial nature of its material support, it opens up a space in which media studies can attend to both. Lynn Spigel and Jan Olsson, eds., Television After TV: Essays on a Medium in Transition (Durham, NC: Duke University Press, 2004). Marshall McLuhan, “Review: Television: Technology and Cultural Form by Raymond Williams,” Technology and Culture 19, no. 2 (January 1978): 259–61. Raymond Williams, Television: Technology and Cultural Form (New York: Routledge, 1974), 130. Samuel Weber, “Television: Set and Screen,” in Mass Mediauras: Form, Technics, Media (Stanford, CA: Stanford University Press, 1996), 115, 118. Stanley Cavell, “The Fact of Television,” Video Culture: A Critical Investigation, ed. John Hanhardt (Rochester, NY: Visual Studies Workshop Press, 1986), 192. Jane Feuer, “The Concept of Live Television: Ontology as Ideology,” in Regarding Television: Critical Approaches—An Anthology, ed. E. Ann Kaplan (Los Angeles: American Film Institute, 1983). Early expressions of this idea include Spigel and Olsson, Television After TV; “The Death of Television,” Slate, 17 Oct 2005, www.slate.com/articles/technology/technology/2005/10/the_death_of_television.html; “The TV is Dead. Long Live the TV,” Wired, 6 April 2007, archive.wired.com/entertainment/hollywood/news/2007/04/tvhistory_0406; and Alexander B. Magoun, “The Digital Generation and the End of Television,” in Television: the Life Story of a Technology (Westport, CT: Greenwood Press, 2007). For more on new live streaming agreements, see Steve Shannon, “Sling TV, a Live, Over-the-Top Television Service,” Roku Stream Blog, 5 January 2015, blog.roku.com/blog/2015/01/05/sling-tv-a-live-over-the-top-television-service/; The Editorial Board, “Unraveling the Cable Bundle: HBO and CBS Move Toward Selling Content Directly to Consumers,” New York Times, 21 October 2014, www.nytimes.com/2014/10/22/opinion/hbo-and-cbs-move-toward-selling-content-directly-to-consumers.html. Amanda Lotz, The Television Will Be Revolutionized (New York: New York University Press, 2007), 6. Mary Anne Doane, “Information, Crisis Catastrophe,” Logics of Television: Essays in Cultural Criticism, ed. Patricia Mellencamp (Bloomington: Indiana University Press, 1990), 227. “The potential validity of media studies as an independent inquiry therefore depends on coming to terms with the permissiveness of digital technology regarding its use for text, image, or sound, a fact that necessitates theoretical reflections on indifferent transmissibility as such (Übertragbarkeit).” Georg Christoph Tholen, “Media Metaphorology: Irritations in the Epistemic Field of Media Studies,” South Atlantic Quarterly 101, no. 3 (June 2002): 659–72. Paul Glazowski, “NBC Direct To Get a Reboot With Help From Pando,” Mashable 27 February 2008, mashable.com/2008/02/27/nbc-direct-pando/. Walter Benjamin, “The Storyteller,” in Walter Benjamin: Selected Writings, Volume 3: 1935-1938, ed. and trans. Howard Eiland and Michael W. Jennings (Cambridge, MA: Belknap Press, 2006). Walter Benjamin, “The Storyteller,” 151. Michael John Starks, “Digital Convergence and Content Regulation,” VIEW Journal of European Television History and Culture 3, no. 6 (2014): 125–35, viewjournal.eu/index.php/view/article/view/103. Grant Wythoff is a Postdoctoral Fellow in the Society of Fellows in the Humanities and a Lecturer in English at Columbia University interested in the history and theory of media technologies, twentieth century American literature, digital methods, and science fiction. He is currently at work on two book projects: a cultural history of the gadget and a critical edition of Hugo Gernsback's work titled The Perversity of Things, forthcoming from the University of Minnesota Press. Grant has work published or forthcoming in Grey Room, Journal of Contemporary Archaeology, Wi: Journal of Mobile Media, The Programming Historian, and The Appendix.